To be or not to be, do I ski it from here, or climb into the chute to ski, hum like the lines of a movie, "do you feel lucky"? Okay, now that you've seen me take a stab at rating the Legend's Notch runs and several of the steepest Lake Chute entries, it's your turn to take a stab at blasting my rating! The goal in all this fun with controversy is to establish a realistic risk and aspect rating of Double Black EX chutes that gives a comparative guide post to others wishing to enter these zones of extreme 'in bound' fun. Click on this Yell Loud and Clear to enter the Steep Chute BLOG page. It's time to drop in and log your ratings. I'd recommend using Lou Dawson's Wildsnow D/R rating for comparison. But all experience is good, and safety advice is of premium value. Cheers as they say in Canada!! Okay, this is a view three quarters of the way down the Narrow North Pole Double Black EX run. We accessed this chute by cutting skiier left, up high, and carving in over the vertical half pipe. Knowing this is most of the way down the chute puts you perceptually into a similar exposure experience as dropping over the top of the Lake Chute area. However, the upper portion of the Lake Chutes are a bit steeper than this lower position on the Narrow North Pole. The following Slide Show is about someone I met skiing extreme notches on a day in spring of 2008. <?xml:namespace prefix = o ns = "urn:schemas-microsoft-com:office:office" /> On the hike up from 12k+ (where the lifts end), to the summit high above Abasin at almost 13k, I encountered a boy Kevin Brod, who is 14 years old, and his little brother Cameron who is 9. I wondered to myself, "didn't they see the signs, Extreme Terrain, Avalanche Blasting Area, Double Black EX, Ski at your Own Risk, Rescues and Evacuations are difficult from this Terrain?" I asked them if they knew what they were getting into, knowing the only paths down the east wall from the summit were steep chutes between cliffs and rock bands. Kevin nodded his head, and gave me that, "I'm sure look" and plodded ahead up the steep snow carrying his skis as his brother followed. Shortly behind me was a man, also heading up the steep rocky snow and ice covered terrain, and once I was getting close to the summit, I commented to him about the kids. 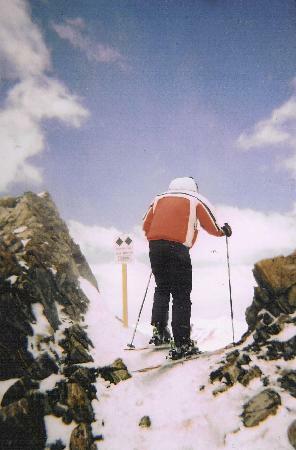 I found out this man nearing the summit was their father, John, and he said Kevin lived for extreme skiing, it was in his blood and was everything he'd ever wanted to do. When John could see a hair of inquisitive protest in my eyes, John told me, "that's not the only story here, see Kevin has a pace maker, has spent months in hospitals, almost died, and has only a three chambered heart, which means he suffers from oxygen starvation. I listened to all this while I was out of breath making my way up the last 20ft of steep rocks to the summit of the mountain. At that point I realized something incredibly special, Kevin was not only beating the odds skiing 50-60 degree terrain being 14 years old, and going for extreme skiing that turns back many expert adult skiers, but Kevin had the resolve to get himself out of the hospital, driven by a vision and a dream to ski steep, and hiked a 13er to ski a dangerous cliff laden chute. Okay, many kids in Kevin's shoes are maybe lucky enough to get a visit from The Make a Wish foundation, and possibly get a shot to do something they've always dreamed of, but Kevin's taken this one step further, he made this wish happen himself. And, not to forget, his little brother Cameron, age 9, made the grueling trip to the summit, and dropped down the 45-50 degree First Notch with his brother Kevin, showing solidarity to go to the limit with his big brother. I watched them from the rock bands above, and saw their gutsy, but deliberate and careful descent. I believe Kevin, and his family are living inspirations to other young children who have such heart problems, and who also face lengthy hospital stays and heavy surgery. I cannot put into words how impressed I was in meeting Kevin and Cameron. Now, to take one more moment, for those of us who've done the 1st and 2nd Notches, in true EX fashion, Kevin sailed off the summit cornice to drop straight into the chute. You've got to see the pictures of these young adventurers for yourself in the following slide show. Way to go Kevin, Cameron, and family. Your spirit is remembered on the mountain summits of Colorado.